The Azerbaijan Carpet Museum launches new project. "Touching History and Tradition" is an international project designed for people with visual disabilities. This is the first-of-its-kind project in Azerbaijan. The event will be held from February 1 till March 1. 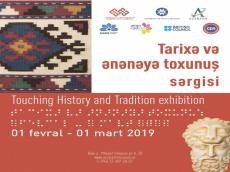 Throughout February 2019, the Ministry of Culture, the Carpet Museum, and Azersun Holding group of companies within the support of ASAN Radio, ASAN School, and the British Council will organize a joint Azerbaijani-Turkish exhibition Touching History and Tradition. It is based on a traveling exhibition of the Turkish public organization GEA Arama Kurtarma Ekoloji ve ?nsani Yardim, which has already had great success in Turkey and other countries. The exposition consists of 15 replicas of the world museums’ great exhibits (sculptures, small busts of ancient Greek philosophers and legendary heroes). For its part, the Azerbaijan Carpet Museum complemented the project exposition with exhibits specially made by museum weavers of the Traditional Technologies Department. These are miniature samples of pile carpets, as well as all varieties of flat-woven carpets, such as palas, kilim, shadda, zili, etc. The individuals with visual disabilities will have an opportunity to vividly assess with the tactile method the difference in the interweaving typical to each carpet type. In addition, all exhibits are accompanied by special audio recordings and written materials in Azerbaijani and English Braille. This event is intended to be a pilot project in Azerbaijan. A similar method for displaying exhibits will be widely implemented in the Azerbaijan Carpet Museum’s exhibition activities within the next few months.